In many churches around the world today, people will hear the story of Jesus’ final entry into Jerusalem and they will then be invited to take their palms and process into or around the church waving those palms and singing “Hosanna!” The invitation is usually met with varying degrees of enthusiasm and for many; there is an awkward discomfort about it all. Some who feel it is just too weird, opt to stay in their pews and observe from a safe distance. Well, if it feels a bit awkward – guess what – it is supposed to! This ritual is just a small version of the faith journey we will be experiencing in the week ahead of Holy Week. Unlike the people who cheered and sang out at the time of Jesus’ triumphant entry into the city, our present-day discomfort comes, in part, from knowing what comes next in the story of Jesus. We know that in a very short time, “Hosanna!” will turn into “Crucify him!” Knowing what is to come within the same liturgy has many of us feeling slightly hypocritical and this isn’t a comfortable feeling. The procession, however, is also a tangible way to acknowledge our own faith journey. The story of the cheering crowds who soon become the belligerent mobs, reminds us of the ups and downs of our own attempts to be followers of Jesus. At some point in our lives, we have been one or all of the characters in the scripture story. 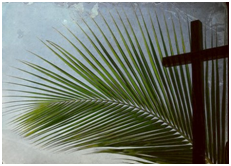 We have been the “Hosanna” people when life was going well, our sense of God’s presence was strong and our efforts to do the will of God were filled with positive hope and promise. We have at times been the curious bystanders who watched as an opportunity to do what Jesus asked of us was presented, but we decided to sit back and blend in with the silent majority; perhaps because it required too much effort or we didn’t see it as “our problem.” Many may have felt the sting of betrayal, of prejudiced and false accusations and wished it would all go away. Many of us have seen loved ones suffer through the pain and injustice of events beyond their control and wondered, “Where are you God?” We have all had moments when fear and doubt overwhelmed our intentions to the right thing. We have all acted in ways that hurt others, sometimes irreparably, and wished we could undo it all.